On the morning of October 7th I very reluctantly said good-bye to the seductive Seychelles and launched off their long runway for a flight into a very different world. I was now on my way nonstop to Harare, the capital city of Zimbabwe, in the southern part of Africa. Since I couldn't cross the Middle East for political reasons, and since the central nations of Africa were in revolutionary turmoil, I had elected to divert down the East coast of Africa and to cross the continent in the relatively peaceful Mozambique, Zimbabwe, Botswana, and Namibia stretch. The flight to Harare took just under 12 hours, and was uneventful. It was great to be flying again after a few days of R & R. I crossed the Indian Ocean with Madagascar just out of sight to the east of me, and flew directly over the Comoros Islands as I approached the African coastline. Mozambique was the first country I crossed, but by the time I reached it the sun was again lazily sinking below the horizon, so I saw very little of that country. Given the paucity of lights on the ground, one can only assume that it is far from overpopulated. One thing I did note on this flight conflicted with all the "hangar talk" I'd heard over the years about ATC controllers on the African continent. The scuttlebutt is that they don't pay much attention to you, and if you have to ditch or make an emergency landing for some reason, no one bothers to do anything about searching for you. Well, my experience was that the controllers from Madagascar to Mozambique to Zimbabwe were very concerned with my welfare throughout the flight. If I didn't get them a radio report of my passing any specific waypoints within just a minute or two of the expected time, they called me to see if "ops [operations] were normal," their slang for asking if I was still alive. They also asked for "ops normal" reports from me every 30 minutes, when 80 - 90 minutes was the norm over most of the rest of my trip. They also asked how my ride was (i.e., turbulent or not) and even chatted about my trip and plans. They were great! Harare has a very modern and well equipped airport, and the next day I was able to get another oil change and an engine check-up at an excellent maintenance facility on the field. 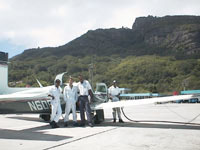 The refueling crew preparing the plane for departure from the Seychelles. Note the precipitously rising terrain behind the terminal. Such topography is beautiful for a non-pilot to look at, but aviators know instinctively that when the winds cross over ridges like these adjacent to a runway, the resulting turbulence makes for some challenging takeoffs and landings. In my case, the winds were delightfully calm, both for my arrival and departure. Overflying the Comoros Islands on the way to Zimbabwe from the Seychelles. The Comoros Islands comprise a tiny, independent nation, and I had to obtain an overflight permit to fly this route. 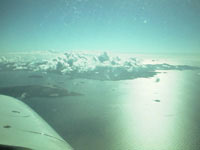 The islands were quite picturesque from his 6,000 ft altitude. They are located between Madagascar and the southeastern coast of the African continent. 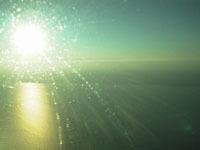 Sunset over the East coast of Africa as I approached the shoreline of Mozambique enroute to Zimbabwe. Mozambique also required an overflight permit. 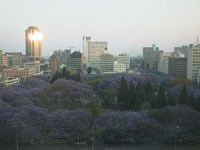 Sunrise in Zimbabwe's capital city, Harare, as seen from my hotel window overlooking the central park area. For a Third World country, the skyline is quite impressive, although a short drive outside of the city will take you to small, subsistence level villages. Because life in the country is so tough in Zimbabwe, recent years have seen thousands pour into the city in search of employment. Finding few jobs, more and more have turned to crime, a rising problem throughout southern African countries, most notably Zimbabwe and the Republic of South Africa. Even though I stayed in a highly secured, five star hotel, I found this sign near the elevator on my floor. 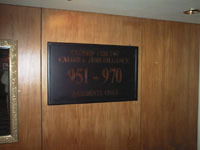 It reads: Closed Circuit Camera Surveillance. . .Residents Only. Violent crime in this part of the world is probably worst of all in Johannesburg, South Africa, where there are multiple car jackings, muggings, and senseless murders every day. The per capita homicide rate is perhaps the highest anywhere. I didn't bother to go there! Ever since leaving Hawaii over a month earlier, I had been feeling the effects of the worldwide currency crisis. Locations that before had routinely accepted US issued credit cards were no longer doing so, as the credit card companies honor only the free market currency exchange rates, and these are far less attractive to the local merchants, given governmental currency controls. Thus, I had to pay cash in US dollars for fuel, landing fees, maintenance, and aircraft handling almost everywhere I went. Only hotels accepted Visa, MC or Amex cards. By the time I reached Africa, my wallet was running dry. Getting more cash in US dollars turned out to be a major obstacle. If I were to have money wired to me from my American bank via a local bank in, say, Zimbabwe, then the Zimbabwean government would keep the dollars for itself and issue to me only the "equivalent" (in the government's view) in Zimbabwe Dollars. I would thus receive currency that couldn't be used in any other country, and it also probably couldn't be changed back into US dollars anywhere, either. I spent hours going from bank to bank in Harare trying to solve the problem, but none would help, citing government controls. Even the American Express office refused to sell me US dollar denominated travelers checks using either wired funds or a credit card advance. 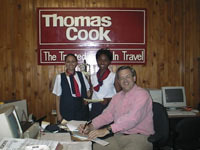 I'm gleaming in this picture, because with the help of manager Helen (left) and assistant Kudzai at the Thomas Cook travel office in Harare, I was finally able to buy travelers checks using a loophole in the regulations. The fees involved were nothing short of extortionist, but it was either that or stop flying! Oil change number five of the trip. 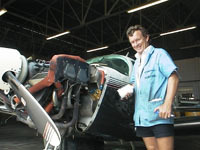 Paul, maintenance supervisor of Hunting Airmotive in Harare, Zimbabwe, is shown here installing a new oil filter.